DXRacer Formula Series ▷ Size & Buying Guide on GOTURBACK.UK! The DXRacer Formula is an average chair for average people. Don’t let the word average put you off though, average in the sense that it has all the basic features a gamer needs. There are better chairs out there, but for the price, this is a smartly designed seating solution. You won’t get leather and carbon fiber with the Formula, but what you will get is comfort. The chair is finished with PU covering and carbon look vinyl, so it looks great but may not be as heavy duty as more expensive chairs. However, if an upgrade from a standard chair is what you’re looking for, then you won’t be disappointed. Like most of the chairs in the DXRacer series, the design is resemblant of the kind of seat you would find in a high-end sports car, which is a popular style in the gaming world. The Formula has a variety of adjustable parts. Basically, all that most gamers will need to sit comfortably. These include 3D armrests which are lockable, more expensive models come with 4D armrests, but 3D are sufficient for most gamers. The chair is built around a steel frame, with high-density foam for added comfort. The great thing about this particular chair is that it includes lumbar and neck cushions, which often have to be purchased separately. This is good for those on a budget that still want a reliable and comfortable chair. The Formula also rocks up to an angle of 170 degrees, which is often seen by gamers to be a real necessity in a chair. 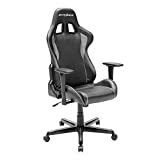 In addition to this, the backrest reclines, allowing you to take a break and stretch out during gaming days. This chair does not have a leg rest, however, but does include a foot rest base which has been ergonomically designed to allow users to rest their feet in a comfortable position. As with other chairs in the range, you can be sure that your floor will not be damaged thanks to the floor-friendly casters that the chair is mounted upon. It also includes a premium class 4 gas lift, which is great for adjusting the height of the chair quickly. Overall it is very average, but sometimes average is what you need. As this is a cheaper model, the weight limit isn’t as forgiving as other chairs and is stated at 120KG. Therefore, if you’re a bit on the heavier side, this might not be the chair for you. The DXRacer Formula is available in a good selection of colours. You’ll be able to choose from black and white, grey and red, blue and black, orange and black, and plain black. In terms of additional features, as the chair is very basic there aren’t any available. However, as mentioned, it does include lumbar and neck cushions which are a real bonus. The Formula Chair is quite limiting in terms of the suitability for larger gamers. With a maximum weight limit of 120KG, it isn’t as generous as most expensive models. For the average sized person, it should be okay, but it might be a good idea to look at the weight and height limits provided. You will find that the chair has a full-size frame, but larger people may have some difficulty getting comfortable in this chair. If you’re on the taller side, you should be fine as the chair is suited for those up to the height of around 6ft 2inches – 6ft 4inches, if you are a bit taller though, you might want to look elsewhere.